Olivero, Capecchi, Ferrari, Aarden, Ventriglia, Carlin; Vernizzi, Amsterdam, 1965. Booklet includes Olivero interview on her return to the stage as Adriana. CD version contains 2 CDs. Those familiar with Opera Fanatic: Stefan and the Divas may wish to compare Olivero’s Adriana monolog here with the one she performs there. 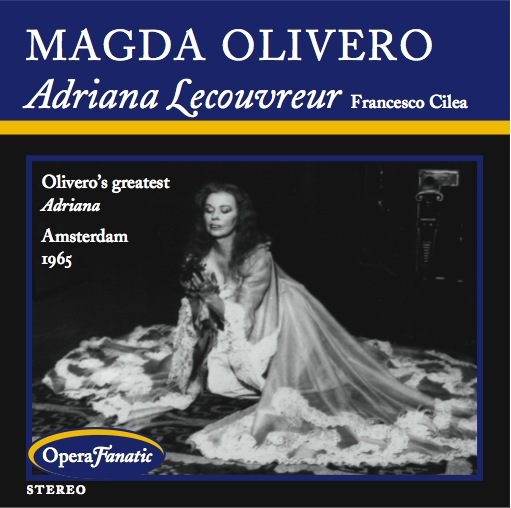 “The opera with which Magda Olivero is most identified is Adriana Lecouvreur, Francesco Cilea’s 1902, verismo classic. Cilea himself so admired Olivero’s performance of his heroine, which she first sang in 1938, that he thanked her for her interpretation: Olivero’s approach to the end of Adriana’s entrance aria,”Io son l’umile ancella,” was sanctioned by the composer as the way it should be done. Adriana, in fact, was the role that brought the soprano back to the stage–at the request of its dying composer–in 1951, after a decade of premature retirement. But the fact that Olivero studied the role of Adriana with Cilea would count for little were it not for the fact that the soprano is, as Adriana describes herself, the humble servant of the creator’s genius. Olivero is Adriana and vice-versa. “Having seen Olivero as Adriana in the late 1960s, this writer can attest to the glory of her singing and acting, the total identification she brought to the role and her absolute rock-solid control of her voice, including an eerie pianissimo used–but never overused–to haunting effect. When it comes to interpretation on this level, subjectivity will dictate one’s favorite–all available Olivero Adrianas are worth having. But this Adriana is arguably her most vocally secure, beautifully measured reading. The many vocal effects aimed for by Olivero, then fifty-five, are all achieved in this concert performance, without cheating the drama in any way: the Act III Phédremonologue and all of Act IV, from “Poveri fiori” on, are perfection. “The balance of the cast lends more than adeqate support. Tenor Ferrando Ferrari’s Maurizio is a bit too lyric in weight but idiomatic and elegant in delivery. Renato Capecchi is a terrific, nuanced Michonnet, Mimi Aarden a fiery, fearless rival as the Principessa and Mario Carlin the quintessential oily Abate di Chazeuil. Fulvio Vernizzi conducts lovingly, and the Broadcast Orchestra plays superbly. I regret never seeing Magda Olivero on stage. Adriana Lecouvreur, one of her finest roles, can be heard from various venues. That from Amsterdam in 1965 with Ferrando Ferrari as Maurizio appears in good sound on Opera Fanatic. Listen to Olivero’s artistry. She has the mastery of the role, producing abundant vocal dynamics, from a delicate fil di voce to prima donna passion: everything in accordance with Adriana’s feelings and interactions. The almost forgotten Ferrari also introduces a range of shadings and contrasts. He is a lirico spinto tenor who is willing to sing quietly yet possesses a ringing top. Renato Capecchi pleases with one of the most restrained openings to Michonnet’s Act I monologue, and one feels it is just right. As the Princess, Mimi Aarden links her upper and lower tones awkwardly once or twice but suggests the woman’s envy. Does a better recording of Cilea’s opera exist than this one under Fulvio Vernizzi?